Germany, 1972, 95 minutes, Colour. The setting is Peru, 1560. Pizzaro is leading conquistadors and friars into Inca territory. The film focuses on a small group which goes upriver to seek the fabled centre of gold, El Dorado. While on their trek, the group decides to declare its independence of Pizzaro. They continue upstream, in dangerous territory, through raging rivers and rapids. They are continually attacked by the cannibal Indians. Ultimately, they are all destroyed, leaving the fanatic leader, Aguirre, who styles himself The Wrath of God, alone on his shambles of a raft. The film has the structure of narrative from a diary kept by the Franciscan chaplain of the group, also an intense man, who wants to convert the heathens at any cost. The film is a harsh picture of the Spanish colonial attack on the Incas. It presents some insights into the response of the American Indians. 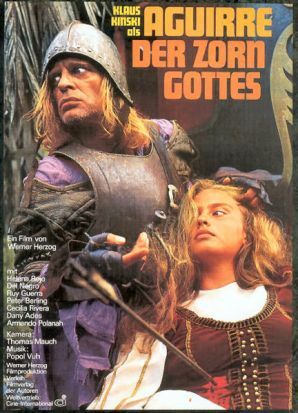 The same material was treated in the film version of Peter Schaffer's The Royal Hunt of the Sun, with Robert Shaw as Pizzaro and Christopher Plummer as the Inca king Atahualpa. 1. A portrait of historical period? Interpreting the period for the 20th century audience? Conquest, empire? European supremacy and arrogance? The role of Christianity? The effect on the American Indians? 2. The work of Werner Herzog? His interest in landscapes and terrains? Humans within these contexts? Human ambitions, humans overreaching their powers? The tendency towards destruction and self-destruction? 3. The South American locations: mountains, rivers, jungle, native villages? The camerawork - especially for the action sequences, especially on the river? The musical score, choral work? 4. The title and the focus on Aguirre? Klaus Kinski's screen presence and appearance? Fanatic, leading the group, second-in-charge to Guzman, seeking his opportunity to take over? His harsh judgments? His plot against Ursua? Going further into the jungle? The quest for gold? His ruthless leading of the men? Taking over after Guzman's death? The close-ups, his intense appearance, fierceness? His decisions, the death of the men, the death of the young girl? His being left alone? His declaration of his self-importance, grandiose images of independence from Spain, conquering Trinidad and New Spain, himself as emperor? Left alone by the circling camera on the raft? 5. The background of Spanish history? The 16th century and empire? The arrogance of the conquistadors, the type of soldiers sent on these missions? Officers, enlisted men? The friars and their intense evangelistic attitudes? The presuppositions about taking over the land, treatment of the Indians, hostile attitudes, the search for gold, greed? Establishing of empire and power? The reaction of the Indians, the interpreters, translating? The change of clothes? The Indian musician playing? The pursuit by the tribes, the massacres, cannibalism? The young couple coming to the raft and the harsh treatment by Guzman and the friar? The attempt at enforced conversion, the Indian trying to hear the word of God and listening to the book, the brutality of the friar? The film's comment on Spanish conquering? On the Indians? 6. The presentation of Pizzaro, his sense of mission, the seeking of El Dorado? The division of the men? Guzman and his self-indulgence, pomposity? Attitude towards Ursua - but pardoning him? His death? The women on the raft, their decisions to come, the hardships, their deaths? The death of Ursua after the trial, his wife's support? 7. The presentation of the men, their courage, foolhardiness? The attacks of the Indians, the deaths? The change of heart? Wanting to return? 8. The Indian guides, the translations? The hostility from the native Indians? 9. The friar, his diary, the details of what was happening, the period of six weeks during the winter/summer? His observations on what was happening, the futility of the mission? His judgment of Ursua? His harsh attitudes towards conversion? His death? 10. A portrait of a period? An interpretation for 20th century audiences?